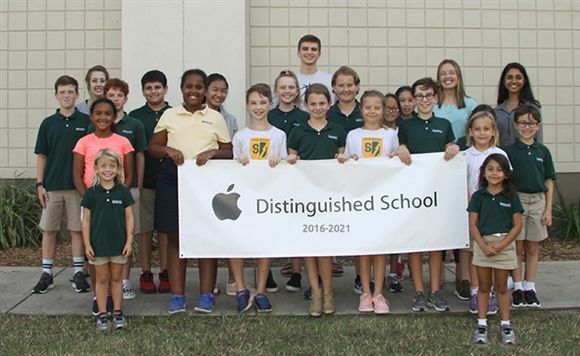 Shorecrest Preparatory School is pleased to announce that it has been named an Apple Distinguished School for 2018-2021. Shorecrest was awarded the distinction for its innovative teacher-leaders, its successful 1:1 iPad implementation, and the thoughtful integration of technology throughout its PK-12 program. The 2018-2021 distinction is a renewal based on continued evidence of innovation and academic excellence. Shorecrest first received the distinction in 2016. Apple Distinguished Schools are centers of innovation, leadership, and educational excellence that use technology to inspire creativity, collaboration, and critical thinking. They showcase innovative uses of technology in learning, teaching, and the school environment and have documented results of academic accomplishment. "To receive this renewed recognition is a testament to Shorecrest's ongoing commitment to providing an innovative, student-centered learning environment and to ensuring our students are prepared to thrive in a continually evolving technological world," says Director of Educational Technology Dr. Anna Baralt. "This recognition is just one of many indicators that we are preparing students for their future," Shorecrest Headmaster Mike Murphy adds. "The stellar leadership of Dr. Anna Baralt continues to inspire our faculty and staff to use technology to transform teaching and learning at Shorecrest in a way that supports our students." Walk into any classroom at Shorecrest to see technology supporting student success. For example, in the Center for Medical Sciences applied sciences track, Upper School students used iBooks Author to create children’s books about the systems of the body which they presented to first graders. Even the youngest of Shorecrest’s students use technology to support their research and in-depth project work. When junior kindergarten classes studied the water cycle, one five-year-old utilized the Slo-Mo feature of the iPad camera to explore the process of evaporation. She brushed water on the school’s sidewalk and drew a chalk circle around the spot it made. Her time lapse video showed the water spot retracting, demonstrating real-world evaporation. As technology and pedagogy continue to evolve, Shorecrest maintains faculty professional development as a top priority, ensuring teachers have the resources, skills, and habits of mind to best serve their students.